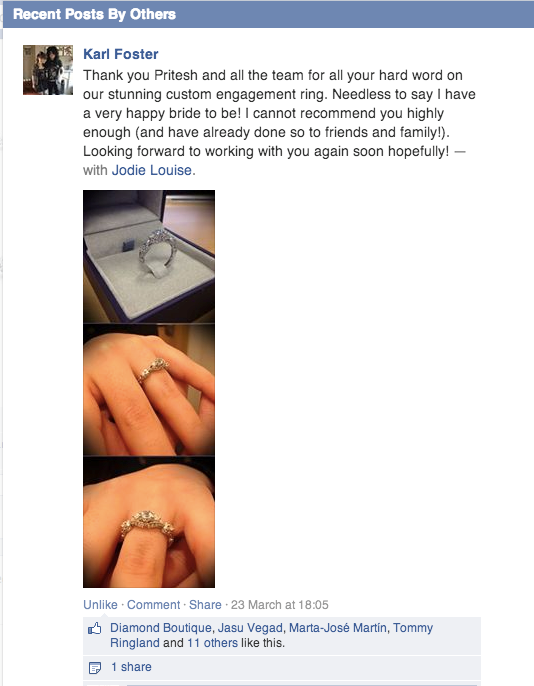 This is the customer service experience from Karl Foster who commisioned an engagement ring from Diamond Boutique in 2014. For my planned proposal to my, then girlfriend, Jodie I knew that I wanted to make a grand gesture of how well I have grown to know her and her style, and that an off the shelf ring would not be representative of how unique and special she is to me. The romantic thought behind proposing with a ring that nobody, anywhere, would have appealed to me greatly and I knew exactly what I wanted. After seeking quotations from a number of High Street retailers, independent jewellers and specialist “designer days” for my perfect ring I was left with very little confidence that I would be able to achieve exactly what I had in mind with these services. I received a mixed response of extortionate prices, vague details and in one case a price so drastically lower than the others I had seen that I knew they could not have properly understood or listened to what I was asking for. All of these services required money up front before any visual representation of my final ring was even shown to me – Just a promise that they would try and work with the images I had provided – even though I did not want a replica of these images. My line of work leads to me being a bit of a creative control freak so being kept out of the loop until such late stages in the project was extremely disconcerting. All of these negative factors combined lead to me dropping the idea for a while and instead focused my effort on scouring the country and online for antiques, or jewellery designers that might have something even close to what I was after ready to buy or commission. It was during this search I found Diamond Boutique’s online selection. Immediately I was impressed with the professional website and good range of not only diamond rings, but a good selection of gemstone based designs – something that I had surprisingly found quite difficult to find on many other sites. The page that immediately caught my eye however was the Art of the Possible section, promising a full design service. Having such bad luck previously with this I was sceptical but thought that it must be worth another try. I submitted my request, with full detail of everything I was after and reference images. I received a fast reply and even from the first communication, Pritesh and the team provided me with a rough technical drawing of what they envisioned from the details I had given them. The drawing I received in that email was immediately what I was after – needless to say this was already steps ahead of any service I was offered on the high street. Pritesh gave me a variety of options when it came to the choice of gemstones being used, and the materials of the ring and setting itself. Each priced individually so I could work with my budget and ensure the quality of the ring is to an good standard for my purpose. Diamond Boutique have a great social media presence so it was incredibly easy to find the glowing praise from all their previous customers – that filled me with all the confidence I needed to confirm the order and proceed through the design stage. The initial vision from Diamond Boutique was so near the mark that very few major changes were needed during the design process, but when there were parts I wanted changed slightly they were happy to help and got them added immediately. The end result was a ring that I felt was designed exactly how I had asked, but supported by the experts at Diamond Boutique to ensure we had something that was both beautiful, comfortable and structurally strong to last the years. In my line of work, I create and render 3D models on a regular basis so although the CAD render provided to me was superb I knew that if I could see the raw 3D CAD model itself I would understand every last detail prior to approval. Even requesting this model was not too much for Diamond Boutique who arranged for the file to be sent over to me, something that quite honestly I thought would be asking too much of any design service. It was worth it however, as seeing the CAD model in full, I knew that it was nothing short of perfect and immediately signed off the ring for manufacture! After this it was simply a matter of waiting for the manufacture and delivery of the ring. Even during this stage Diamond Boutique kept in touch to keep me updated at key points of the process. Once the ring arrived I was so happy with all the work and effort that Diamond Boutique had put in. It really was perfect. The colour, the size, the sparkle – every single last tiny detail was there. I proposed in Prague with the ring on 15/03/2014 to a very definite yes, she absolutely loves the ring and thought behind it – and needless to say I have a very happy bride to be! The response to the ring she has had from friends, family and anyone who has spotted it has been unbelievable. Obviously the original intention was to create something that she liked, but the positive feedback has definitely added to the euphoria of the engagement and given her something to cherish as a symbol of our love. Overall, the service from start to finish has been exceptional and I would recommend it with highest praise to anyone who is thinking about going down the custom route for jewellery. And, if you enjoyed reading about this customer service experience, please do not hesitate to submit positive reviews about companies listed on Very Good Service’s website.